Are you afraid you'll hurt the people you care about if you say NO to them? Can you set limits when employees neglect their responsibilities? How about with your boss? When friends ask you to do something you don't want to do, do you invent an elaborate excuse? Do you have a hard time saying NO to an invitation even when you're completely exhausted? Do you have trouble even practicing the sentence "No, Mom, I just can't make it home this holiday"? No is a very simple word -- two letters, one syllable. Yet many women have a hard time saying it without feeling anxious or guilty. 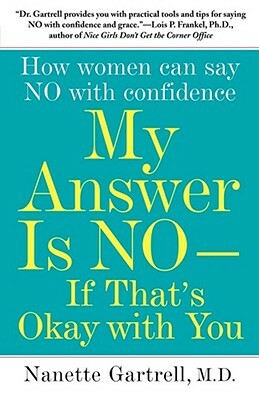 In My Answer Is NO...If That's Okay with You, award-winning psychiatrist and author Dr. Nanette Gartrell takes a fresh look at why even the most powerful, accomplished, and successful women find it difficult to say no and offers a revolutionary approach to setting limits without jeopardizing important relationships. Today women are bombarded with messages like "put yourself first" and "stop being a people-pleaser." But this sort of advice is useless to women who value the caring and generosity that prompt them to say yes in the first place. Through personal interviews with a diverse group of talented women, including CEOs, celebrities, physicians, and public officials, Dr. Gartrell shows that women's reluctance to say no stems from valuable traits that they should embrace, such as empathy, sensitivity, and thoughtfulness. With humor and wisdom, Dr. Gartrell reaffirms the psychological importance of compassion and feeling connected, which can often lead a woman to say yes rather than no in order to preserve a relationship or spare someone's feelings. Through entertaining anecdotes and insights from her years of clinical practice, Dr. Gartrell teaches women to honor their best instincts while still maintaining boundaries. My Answer Is NO...If That's Okay with You offers creative, practical ways to transform an automatic or reluctant yes into a healthy, respectful no -- and still feel good about it.